The development debate in Pakistan has moved on considerably in the past 30 years, and local communities are playing an increasingly important role. Their involvement should be welcomed and encouraged, because it is vital for ensuring the acceptability and sustainability of development initiatives. In October 2018, Pakistani television news channels reported on how the local authorities in Pishin, a district in Balochistan province, were building a small dam to cope with frequent droughts in the area. Instead of accepting the government’s proposal to build the dam at a cost of PKR10 million ($71,000), the local community decided to build one itself for just PKR2.1 million under a European Union-funded rural-development program. This self-sufficient approach to development has paid dividends elsewhere in Pakistan as well. The Hunza district in the country’s far north has a literacy rate of 95% – the highest in Pakistan – thanks to successful community-led schools, which outnumber low-quality government schools. And, emulating the Orangi Pilot Project on the outskirts of Karachi, the community built a sewage system with technical assistance from an NGO and financed 70% of the total cost. These are not isolated examples. Frustrated with poor or non-existent state government services, local communities across Pakistan are playing a bigger role in development projects. Such community engagement, if widely replicated, could reduce the burden on state finances and enable the country to develop in a more inclusive and sustainable way. The idea of local communities playing a key part in development initiatives is not new. In 1993, for example, the UNESCO-led Education for All Summit in New Delhi, India, emphasized that education is the responsibility of families, communities, and NGOs, as well as governments. But there has been a gradual change of thinking over the past three decades about how local communities can play a more effective role. In the 1980s and 1990s, communities took a bottom-up approach to development and distanced themselves from government-directed initiatives. Yet this was largely unsuccessful, owing to political tensions and problems with scaling up such efforts. By contrast, there is now a growing consensus that local communities are most effective when they coordinate their efforts with well-functioning governments, NGOs, and private-sector actors. In a 2013 World Bank report, Ghazala Mansuri and Vijayendra Rao highlighted the problem of civil-society failure in the absence of a “cooperative infrastructure” based on functioning state institutions. In a similar vein, Bishwapriya Sanyal from the Massachusetts Institute of Technology previously argued that “development requires a synergy between efforts made at the top and the bottom, a collaborative effort among the government, market institutions, and NGOs which utilizes the comparative advantage of each type of institution, and minimizes their comparative disadvantages.” And a 2004 study by Harvard University’s Asim Ijaz Khwaja concluded that community engagement substantially improved the maintenance of infrastructure projects as long as their participation was limited to non-technical aspects. Such a collaborative approach should help communities feel less isolated in development projects. In this regard,Nobel laureate economists Amartya Sen and Elinor Ostrom referred to the development of “social capital” that allows a community to take the initiative in the event that funding or other forms of institutional assistance disappear. 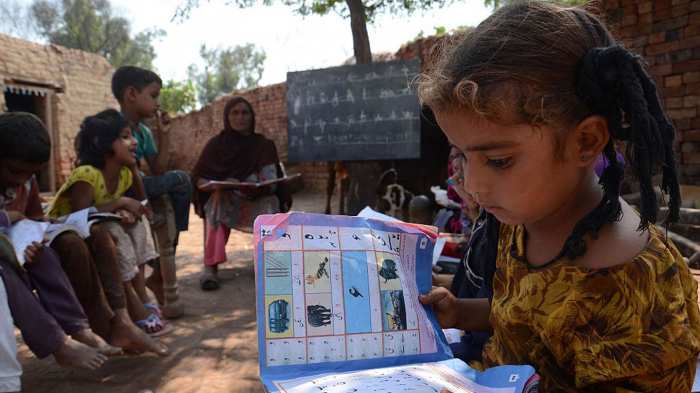 Another education initiative in Pakistan, the STRIDE initiative, provides a further illustration of how local communities can play a positive role in development. The initiative – initially supported by the United Kingdom’s Department for International Development and now taken up by the provincial governments of Punjab and Khyber Pakhtunkhwa and expanded to more districts – aims to improve students’ prospects of staying in school and making the transition to higher levels of education. The initiative introduces afternoon classes and provides transport for students who live far from their school. Crucially, it also seeks to sensitize local communities to retention and transition challenges and encourages them to contribute to sustainable solutions. These efforts seem to be working. In UC Pirhar in the Muzaffargarh district, the local community contributed PKR 48,000 to cover the transport costs of students attending a nearby STRIDE school, and the UC chairman himself gave rickshaws to some of his poor relatives so they could earn money by transporting STRIDE students. Another STRIDE school, in the Swabi district, was having problems retaining teachers for the afternoon shift, owing to long traveling distances and mountainous terrain, coupled with social disapproval of women arriving home late in the evening. To resolve the problem, the STRIDE district coordinator, having first consulted local citizens, persuaded the education department to build extra rooms in the school for use as a teachers’ hostel. The conservative mindset in many areas of Pakistan can sometimes make it nearly impossible for women and girls to travel to a distant school. But by taking citizens’ concerns into account, the STRIDE initiative has enabled girls to continue their education without creating a backlash. The development debate in Pakistan has moved on considerably in the past 30 years, and local communities are playing an increasingly important role. Their involvement should be welcomed and encouraged; indeed, it is vital for ensuring the acceptability and sustainability of development initiatives. Zara Kayani is a research fellow at the Institute of Social and Policy Sciences (I-SAPS) in Islamabad, Pakistan. Read the original article on project-syndicate.org. Iran's Rouhani urges Mideast states to "drive back Zionism"
France asks: should Notre-Dame's spire be rebuilt as it was?